An increasing number of extreme weather events, combined with the outdated, problematic power grid in the U.S. and Canada, is accelerating demand for 360 Energy Solution’s backup generators. Electrical power interruptions of any length create difficulties for business concerns, industrial operations and people. For critical-care operations such as hospitals and nursing facilities, an interruption of even a few minutes can put lives at risk. In the U.S. and Canada, no generator provider is better equipped for, or more conscientiously focused on, serving the entire standby generator market than 360 Energy Solutions. From ultra-powerful diesel generators for industrial and large commercial concerns, to quiet, clean natural gas generators for residential and sensitive urban settings, 360 Energy Solutions’ models represent unsurpassed quality, technical sophistication and mission-sensitive component selection. Equally important, our state-of-the-art, sound-attenuated enclosures provide superior noise and vibration dampening and protect equipment from the elements to ensure longevity and ROI. Beyond the quality of our products, 360 Energy Solutions uses advanced processes and enhanced programs to help owners ensure their equipment is safe, reliable and user-friendly. Services include comprehensive training programs, maintenance and troubleshooting services and more. To learn more about the features and characteristics of our backup/standby generators, we invite you to review our Standby Power Solutions brochure. To learn more about the relative benefits of natural gas versus diesel backup/standby generators, please select one of the options below. To have one of our specialists develop a custom recommendation for your company or customer, please submit a contact request form or call 786-348-2156. Diesel backup generators are available in a wide range of configurations that vary based upon the application and mode of operation. Liquid-cooled diesel backup generators are preferable where quiet operation is required. They also offer a more evenly controlled temperature than air-cooled back diesel standby generators, and cost less to maintain than natural gas models due to a variety of factors, including the absence of a spark ignition system. They are considered more rugged and reliable in very harsh conditions and have longer operating lives. They also will perform with less frequent service intervals. 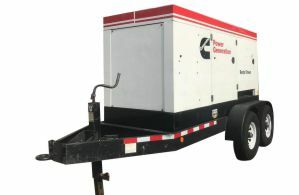 Depending on the size and operating speed of the engine, a diesel backup generator may run for three times as long as its natural gas counterpart before requiring servicing. Industrial, diesel-powered backup generators for standby backup power are commonly found in agricultural, construction, forestry, hospital, marine, mining, telecommunications and underground applications. Diesel standby/backup generators can be outfitted with biofuel systems to burn natural gas, as well.